Maximize your pantry space by utilizing the back of your door with our exclusive Elfa Utility Mesh Door & Wall Rack system. Found only at The Container Store, it makes the most of often-wasted vertical space on a door or wall and is completely adjustable to fit changing pantry needs. The baskets can be easily repositioned to fit items large and small, and the utility Board with Bins gives you endless options for storing small spices, baking necessities and more! You simply won't find a stronger, or more customizable system anywhere else. Build your own customized solution with our Elfa Utility Door & Wall Rack Planner. Elfa Utility White Mesh Pantry Door & Wall Rack is rated 4.9 out of 5 by 7. Rated 5 out of 5 by Jane97 from Best over-the-door rack out there! I bought the over-the-door-rack and four of the large mesh bins to use in my small hall linen closet. I love this system! The rack was easy to install snugly with no holes in my door and the large bins are roomy enough for all of my cleaning products and regular sized rolls of toilet paper. Each bin holds 8 rolls so it really increased the storage capacity of my closet! It looks really awesome too unlike some of the clunky units out there for sale. This is top of the line and, though it's pricey, it's worth it. It's great that you can mix and match the bins to customize your space as well. If you love to organize and are limited on space, I highly recommend this product to put a smile of satisfaction on your face. Rated 5 out of 5 by Justice100 from Love love it!! Best space saving item I've ever purchased and it takes up so little space!! Is there mounting hardware included? With this kit, apparently the hardware is included but if you build your own by mixing and matching your choice of containers to attach, the rack does not come with the hardware. Is the solution light enough to be hung on apartment closets? I just received the long bars that hold all the baskets. They seem too heavy. I just received the long bars that hold all the baskets. They seem too heavy. I&rsquo;m concerned if this will put too much load on the door and perhaps even make it difficult to open and close the door? 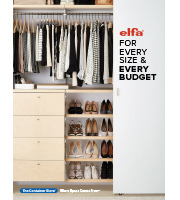 The Elfa Door Racks should work on most standard-size apartment doors. How wide/deep are the baskets? Would it fit an ~18&quot; wide door while still being able to close? Our elfa utility Door &amp; Wall Rack baskets are available in 17-1/8&quot; and 13-3/4&quot; widths and depths from 3-1/8&quot; to 5-1/4&quot; for a customized fit on most any door. what kind of weight limit do these have? Wondering if it can hold canned goods safely? Do the overhead door hooks show when the door is closed? Yes, it will hang over the door 2 centimeters. Will this fit on a door that is 80.5&quot; tall? The Over the Door Hooks of our elfa utility Mesh Pantry Door &amp; Wall Rack adjust for a custom fit to most standard doors - including your 80-1/2&quot; door. What is the item number for the clear containers shown holding flour/beans/dry ingredients? The OXO Good Grips POP Canisters are used in the photos. Please see links below.